Description This tube is first made late in 1905 by H. W. McCandless and Company for the de Forest Radio Telephone and Telegraph Company. It had a four volt carbon filament and was fitted with an E12 Edison screw base. 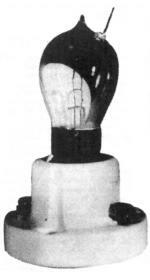 The nickel anode "lead-in" wire entered the glass bulb a few millimetres from the exhaust tip at the top of the bulb. de Forest had acquired a Fleming two electrode tube and asked McCandless if he could make six copies. de Forest applied for a patent on May 19th, 1906 and this was granted on November 13th of the same year. the patent number is 836070. 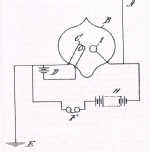 The successors were the Audion_02-electrostatic and Audion_03-electromagnetic developed late in 1906.